Khyber Pakhtun Khwa is rich not only in terms of its cultural heritage but also in terms of biodiversity and human resources of arts and artistry. Almost each district of KPK has its own special products being produced by local rural industrious artisans. These artisans comprise of both men and women. 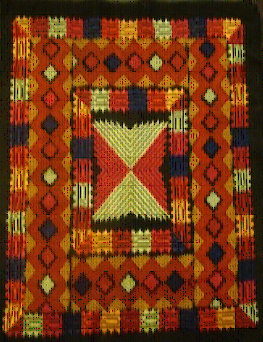 Phulkari stitch and Justi embroidery of Haripur, Swati embroidery of district Malakand, Swat & Dir, Embroidery of Kaka Sahib Nowshera and Cross Stitch of DI Khan hold their distinction in terms of its stitch. In addition the Lacquer & Gillim work of DI Khan, weaved products of Islampur (Swat) and Matta Mughal Khel (Shabqadar), Chitralli Patti Products and Chitrali rugs and Swati Rugs, all handmade items, are famous world over because of their beautiful designs and patterns. The leather products particularly handmade footwear items of Charsadda are popular not only within the province but all over the country. Nazi Naeem is a 40 year old married female who is currently working in Dara Adam Khel (FATA) FDA skill center. 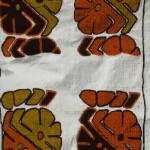 She possessed experience not only in hand embroidery but also in machine embroidery, knitting and fabric painting. She has been working in the field of craft since 1994. Her passion of earning a livelihood through handmade embroidery triggered her into initiating production on her own however lack of entrepreneurial skills and limited resources hampered her to prosper. Nazi participated in Training of Trainers (TOT) Project, conducted by AHAN KPK in collaboration with Fata Development Authority (FDA) in 2013. Sharing her thoughts about her experience in participating in TOT with AHAN; “My experience with AHAN has been rewarding, brilliant and above average”. Though I have been involved in hand embroidery over years however it has been my experience in TOT project that has enabled me to understand market needs, the whole process of production and maintenance of quality in developing products”. According to her the TOT has enabled her to develop new products as per market requirements and helped her link to reliable regional and national distribution channels. Moreover her capacity has improved which will enable her to impart quality training to her trainees. Since participating in the project Nazi has been involved in production for AHAN worth Rs. 65,000. Her skills were utilized as master trainer by AHAN KPK during skill enhancement project conducted in collaboration with UNDP RAHA. Moreover she has also been selected as a master trainer for the ongoing Skill Enhancement & Livelihood Initiative (SELI) currently in process in collaboration with UNHCR RAHA. Nabila Akbar aged 24, has done her Masters in Arts and works at Miran Shah (North Waziristan) Skill Development Centre of FDA. She is an exceptionally talented woman and is also a qualified master craftswoman. 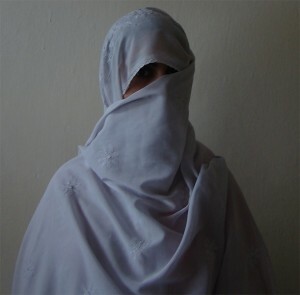 The social structure of her family has remained rigid and does not allow women to interact with people other than members of their own family. Due to these limitations she could not start her own business but has been brave enough to work as a trainer in FDA skill center since 2007. Her expertise is in filling stitch (satin stitch). 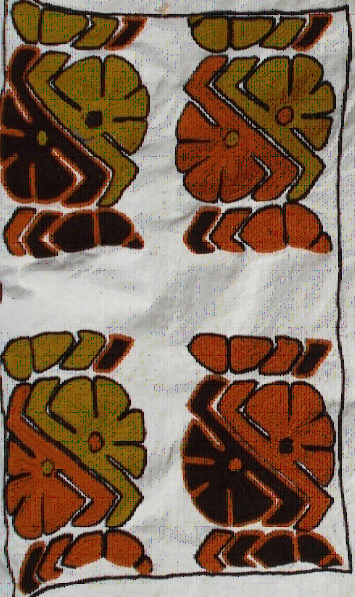 Even though she possessed experience in her craft, lack of market oriented knowledge meant that she was only producing handmade items that were based on obsolete designs made in unattractive colors. The skill enhancement training received under TOT has served to broaden her horizon and instill a new sense of confidence to explore the complete spectrum of her creative talents. She has since been selected through women chamber KPK for participation in United States Exchange Program for the skilled females of FATA. In addition she has established her own display rack at the Women Business Development Centre Peshawar which has enabled her to earn an average of 15,000 per month. Shayama Anis aged 30 is working at Centre Khoi Baharan, FR DI Khan. She has been working in this field from last six years after having received training in traditional embroidery at an early age from members of her family.Shayama Anis, AHAN initiated training of trainers project (TOT) for FDA trainers and she was also selected as a beneficiary of the project (TOT). As a result of her newly acquired knowledge, market exposure (raw material & commercial markets) and participation in this project gave her the opportunity to further polish her skills and focus on products that are geared towards high-end markets. Her zeal clearly demonstrates how women residing in far flung rural areas can be empowered to become successful entrepreneurs by providing them timely opportunities and the right tools. Moreover, with further help from AHAN, she has managed to develop linkages initially for sample development with some prominent established urban markets. Rameem Naz an artisan aged 35 was involved in AHAN KPK’s Winta Wool Capacity Building Project. Being a resident of Village Sarai Koruna, Mardan, Rameem has been involved with the production of winta wool items including sweaters and bed covers since 2006. However it was by participating in Winta Wool Capacity Building Project that she learned to make new marketable products such as cushions, sofa throws and bed spreads in varying colors and designs. She was able to earn substantially as a result by participating in different exhibitions and through completing various orders placed by AHAN. 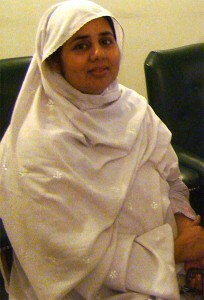 She has earned Rs.118,000 through personal orders and Rs.85,000 through AHAN in the last year. Moreover she has now an organized group of 32 females working for her and thus provides income earning sources to them too. Frazia, a resident of Sarai Saleh Haripur has been involved with AHAN KPK through production orders for AHAN outlet. Aged 50 Frazia has till now produced goods of Justi Embroidery worth Rs.750,000 for AHAN. In the process she has also been able to develop a production group of 49 females. Besides AHAN she has been able to earn Rs.720,000 through participating in exhibitions and receiving orders from third parties. Abida Bibi aged 52 has been working with AHAN since 2010 wherein she was trained as a beneficiary under traditional Phulkari revival Project. She is one of the pioneers of traditional Phulkari stitch in Haripur as most of the females have turned towards the commercial stitch of Justi. According to her, though she possessed the knowledge of traditional stitch of Phulkari it was during AHAN project that she learned different color combinations, the utilization of beads and embroidered buttons and new designs as per market trends. Since then her earning has increased substantially and she now has a group of over 60 females. She has been involved with AHAN orders worth Rs.594,000. Besides that she has earned Rs. 1,700,000 by participating in different exhibitions and producing for different business houses. 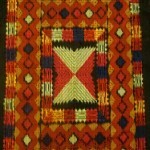 Gabba is an intricate woolen embroidery technique practiced in Azad Kashmir and Hazara region of KPK. Humaira Gul, a 30 year old female belonging to village Ghari Habeebullah in District Mansehra has been working since the age of 10 years in Gabba craft and other stitching typologies and contributing towards her family income. She got associated with AHAN through participation in training projects. Today, she is running her own training center with 75 artisans producing quality Gabba items including cushions, bed sheets, pillow covers etc. She has been able to present her exceptional work in various forums facilitated by AHAN including exhibitions such as Expos at Lahore and Karachi, AHAN SAARC (Islamabad) and with other organizations like TDAP, WALDIAN handicraft exhibition and SABA PAKISTAN cultural fest. Before linking up with AHAN her monthly income was 15,000 per month on average which has increased to almost Rs.75,000 per month since her linkage with AHAN. Farazia Shaheen, a skilled artisan of Phulkari craft is a dweller of district Haripur. Aged 43, she initially started working in Phulkari on a part time basis and with the passage of time developed her skills through participation in various skill development initiatives over the past 13 years. Despite all hindrances and constraints, she continued with the same line of work for the financial assistance of her family. Now she is considered an expert not only in Phulkari craft but in various other embroideries too. Farazia has been associated with AHAN since 2009 in different capacities; AHAN has provided her the opportunity to promulgate her handwork all over Pakistan. She has exhibited her products at different national exhibitions including Abbotabad Cultural Festival, Jashne Hazara Meena Bazar, ITS Islamabad, and women business development center (WBDC) Peshawar and has her works promoted by Noorz Collection and Karvaan foundation. Farazia was one of the lead artisans at USAID Micro Grants kits initiative exhibition held at Lahore by AHAN, where she earned Rs. 370,000.